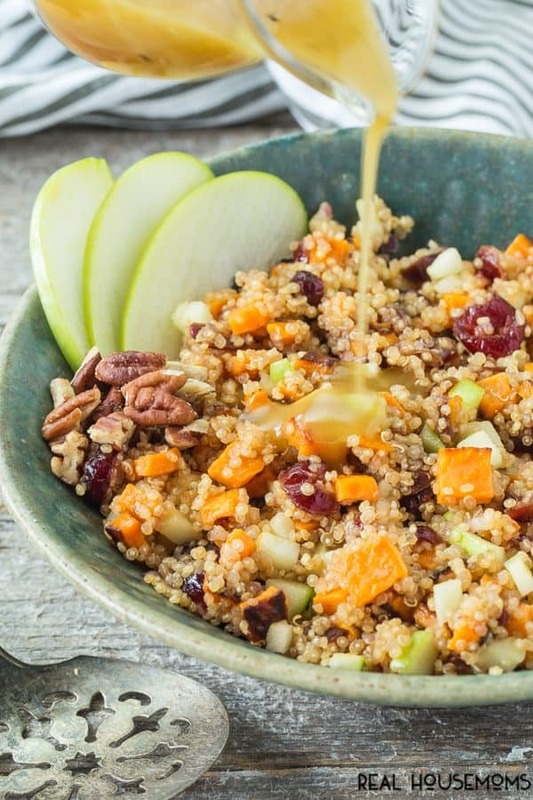 This tasty SWEET POTATO AND APPLE QUINOA SALAD is full of flavor and makes the perfect vegetarian side dish for dinner or holidays! The days are getting shorter, the air a bit cooler and time to start thinking of some fall-ish type recipes. Don’t get me wrong, I love the summer and have enjoyed all the grilling out we’ve done but I do think I’m ready to make the “recipe switch.” Do you do the same with switching out your recipes (summer, fall, winter and spring)? During the summer months, our menu is more quick like grilling, as I mentioned, and simple side dishes – maybe corn on the cob, grilled veggies and fresh cut up fruit. I don’t like fussing too much when I can be outside enjoying the weather. Keeping it simple folks! Now I’m ready to switch gears and comfort food comes to mind. 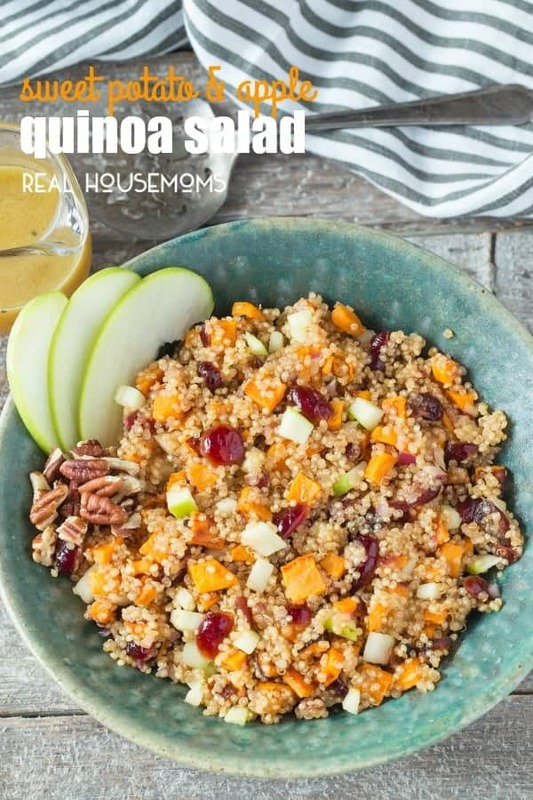 That is where this quinoa salad comes in. 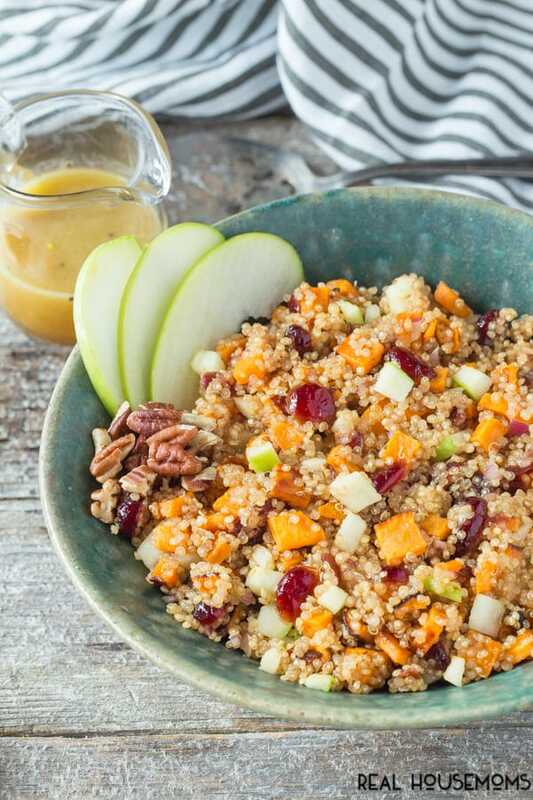 Roasted sweet potatoes, apples, crannies and pecans are so good together and with the addition of quinoa and a maple vinaigrette, you have a hearty dish and one that is lighter on the calories too. I’ll let you in on a little secret – well maybe two! 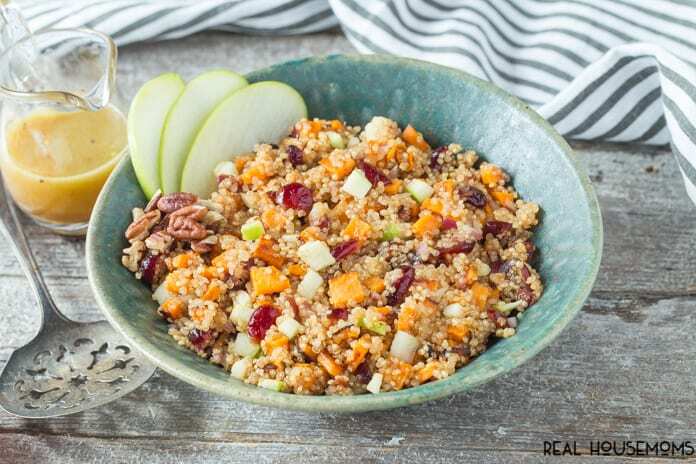 First I cooked the quinoa in apple cider which is a great way for the apple flavor to be carried through the entire dish. Then about one minute or two before the quinoa is done, I throw in the crannies. 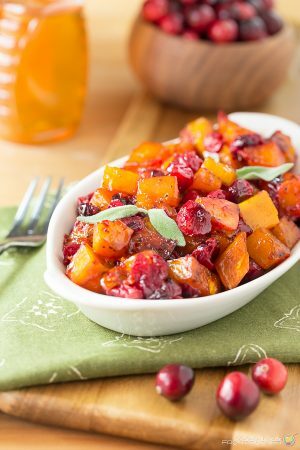 This really plumps them up and is especially great if your dried cranberries have seen better days! (Mine had!) What I also like about this dish is that it can be served warm, room temperature or even cold the next day. While I did not use any “greens”, a scoop of this would be great mixed in with some argula or other green salad mix. I love when one dish can be served another way. 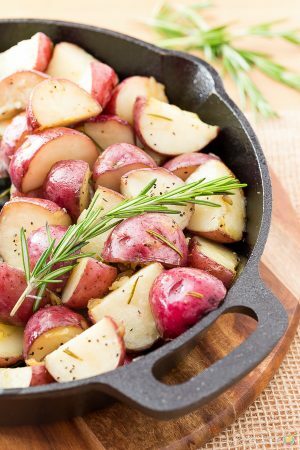 2 medium sweet potatoes peeled and diced into cubes about 1/4"
1 granny smith apple cored and diced into cubes about 1/2"
Toss the sweet potatoes with the 2 tablespoons of olive oil and spread out onto a rimmed cookie sheet. Roast for about 15 minutes, stirring about every 5 minutes until lightly brown and soft. 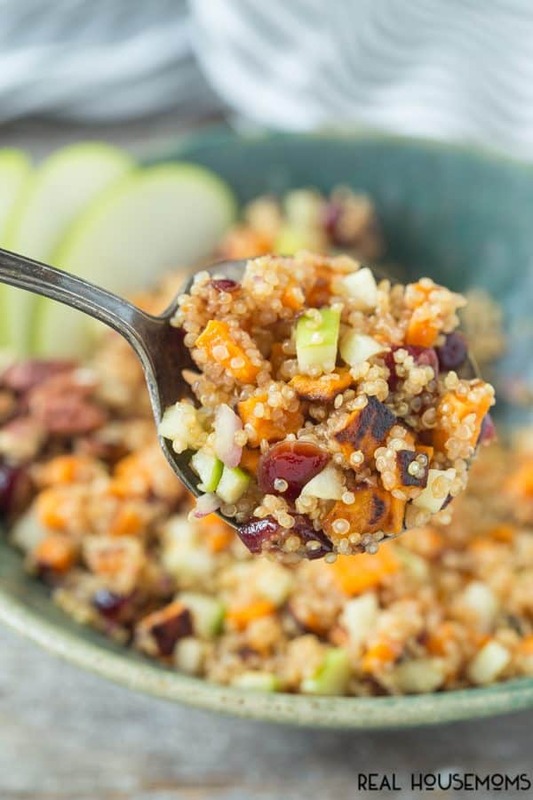 In a medium bowl add the slightly cooled quinoa, cranberries, sweet potatoes, apples, red onion and toss well. In a small food processor combine the maple syrup, shallot, dijon mustard, vinegar and a bit of salt and pepper to taste. Slowly add in the olive oil and mix well.